Most kids love pizza but sometimes it can get a bit messy and complicated, especially with several children. This quick and easy snack lets everyone design their own! It's raining or snowing, the kids are antsy, everyone's hungry and there's no decent food in the fridge. Of course you could get the whole tribe dressed, into the car, drive through the terrible weather to the nearest shop, figure out their orders, sit them down and try to keep them from starting a food fight but why not take the easy way ouy? Why not let the kids make lunch? 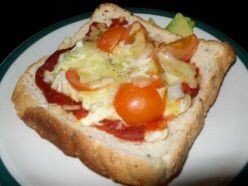 Crunchy pizza toast is a great option that allows kids to get creative as well as eat something they made themselves. As long as you have some bread, tomato paste of some kind and some left over scraps of cheese and salads/vegies you're all set. Just turn on the oven, follow the simple steps below and before you know it you'll all be sitting down to some delicious home made creations. Allow a large work area for children to get creative in. Lay out two slices of bread for each child and help them coat it with a generous dollop of tomato paste. Then let the kids go wild with scraps, cheese and vegies. Once everyone has completed their pizza toast, pop it in the oven on a tray at 180 degrees celcius (350 farnheight.) Leave for 15-20 mins or till cheese is melted. Pull out and serve. Pizza Toast in the oven, ready to cook. ☼ Pictures using different color ingredients. ☼ Buildings or towns using chunks of cheese and other various shaped items. ☼ Half baked - Bake toast with tomato paste and cheese then add cold ingredients from the fridge, such as salads. ☼ Fruit toast - Spread toast with yoghurt or custard. Use different types of fruit on top - or even a fruit salad. This one will only need about 5 mins in oven for warming or can be eaten cold. Fresh pizza toast, ready to eat! I'm off to slap some cheese and other food stuffs on some toast! Great for the days when you don't have answer to "what's for dinner"
A quick snack that looks inexpensive and relatively healthy (if using whole grain breads). Pancakes are a kid friendly food they love to eat and can easily learn to make themselves. Learn how to make the kid favorite snow angel pancakes today.